Preheat oven to 400F. Combine chicken, onion powder, garlic, cream cheese, barbecue sauce and tobasco sauce in a medium bowl and microwave for 1-2 minutes until warm and melted. Place 1 round dough on a cookie sheet or cooking stone and spoon the chicken mixture on top. Place the second dough on top and press to seal the edges. 1. In plastic bag, shake together the pork cubes and Caribbean spices to evenly coat the pork. Brown in a skillet with cooking spray (you can cover and let it cook through- stirring occasionally). About 10 minutes I'd say? 3. in large bowl combine couscous and boiling liquid and 1/2 teaspoon salt; cover and let sit 5 minutes. 4. After 5 minutes, fluff couscous with a fork and stir in craisins, pork, oranges, and almonds. 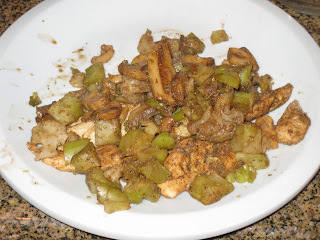 Trim chicken and season with Mrs. Dash and salt. Grill on George Foreman grill for 4.5 minutes. Choose: bean sprouts (drained if canned), baby corn, drained, or canned peas & carrots, drained. However much vegetables you like! 1. Boil rice in bag for 10 minutes. 2. Scramble egg beater in pan. Add rice. 4. Add soy sauce and vegetables, and stir fry until heated. Heat a skillet to medium heat. Spray with cooking spray and stir fry beef until desired cooking temperature. Add soy sauce, spices, and vegetables. Stir fry until heated through. Okay this is going to be a doozey to post. I'm not doing cheese fondue tonight, but I'll go ahead and post my recipe for it at the bottom. Most of this is serving SUGGESTIONS, but you can dip whatever you want! There are many more sauces out there, these are just the ones I like. Nutrition is near impossible to calculate but I'll include what I can. All this makes a LOT of batter/sauces...most of which you won't even use, so don't freak out at the calorie content! 1. Mix all ingredients in bowl until there are no more lumps. 1. Mix all ingredients together. I like it thicker so I eyeball how much water to put in. 1. Heat oil to 325-350 degrees in a fondue pot. 2. Parboil veggies in the microwae to reduce cooking time if desired. 3. Dip meats and veggies in desired batter and then in fondue pot. Leave in until cooked through. I use: beef, shirmp, chicken, fish for meats and carrots, potatoes, stuffed mushrooms (see below), squash and/or zucchini for veggies. 2. 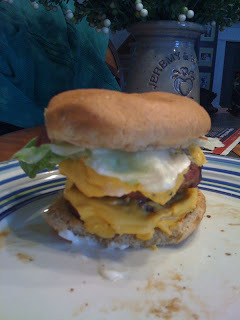 Mix 2oz fat free philly cream cheese with garlic powder and other desired spices (get creative) until blended smooth. I also add minced olives. **Optional add ins: Creamy peanut butter, marshmallows, caramel etc. 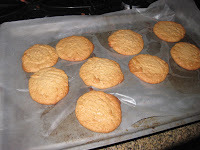 You can use peanut butter or caramel chips in substitution of 1/2 the chocolate chips. 1. Melt all ingredients in fondue pot. Dip things like: strawberries, bananas, cut up sugar free angel food cake, cookies, cookie dough. Entire pot of CHOCOLATE total calories (not including add ins): 1142. Fun recipe: Deep fried snickers: Dip a mini or fun size snickers in regular batter: cook in OIL fondue. 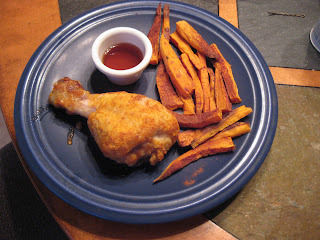 This is a mix and match recipe from Kraft.com. I love it! 1. Melt all ingredients in a fondue pot (stirring occasionally). Dip things like apples, breads, and/or sausage in cheese. I was skeptical of this at first but WOW it was good and easy! *HINT peal and slice bananas before freezing! Place frozen bananas in the bowl of a food processor. It wasn't sweet enough for me (but it was good! ), so next time I'll add splenda. Jeremy topped his with caramel ice cream topping and whipped cream and it was good, and my friend put chocolate sauce on hers. ARRANGE 15 grahams on bottom of 13×9-inch pan, cutting to fit if necessary. 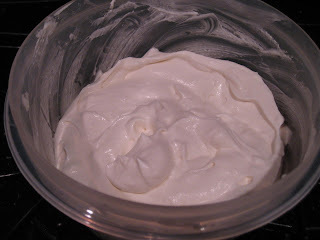 BEAT cream cheese in bowl with mixer until smooth. Gradually beat in 1 cup milk until blended. Add remaining milk and dry pudding mixes; beat on low speed for 2 minutes. Gently stir in whipped topping. SPREAD half the pudding mixture in prepared pan. Top with remaining grahams and pudding mixture. Refrigerate for at least 4 hours or overnight. Originally vegetarian. I added chicken. In a large saucepan, spray cooking spray. Sautee eggplant, zucchini, onion and garlic until almost tender. Rinse and drain black beans, add to mixure. Add canned tomatoes. Add seasonings and chili powder/pepper. Originally a vegetarian recipes. I added the beef, because my husband won't eat it without meat! Roll out biscuits on a pizza stone to make crust. Place in prepared oven for 7 minutes, pressing flat after 4 minutes. Spread BBQ sauce on crust with a spoon. Top with meat, corn, beans, and cheese. Return to oven for 5-6 mins until cheese is browned. My picture is over cooked...I didn't watch...but it was still good! Just crispy! Heat broiler to high. In small bowl, combine all ingredients except chicken; blend well. Brush marinade on the chicken and broil for 4-6 mins. Flip chicken and brush the other side. Cook until finished. (depends on the size/thickness of the chicken. Do not over cook, or it will dry out). Cook pasta in large saucepan as directed on package.Drain. Meanwhile, heat dressing in large skillet on medium heat. Add mushrooms and stir fry until heated. Add cream cheese cook and stir until cream cheese is completely melted and mixture is well blended. Add shrimp. Stir in pasta. Serve topped with the Parmesan cheese. In a mixing bowl, combine the peanut butter, Splenda, the egg beater, and vanilla, and stir well with a spoon. Roll the dough into balls the size of walnuts. Place the balls on the prepared baking sheet. With a fork, press a crisscross design on each cookie. Bake for 12 minutes, remove from the oven. Cool slightly before removing from pan. 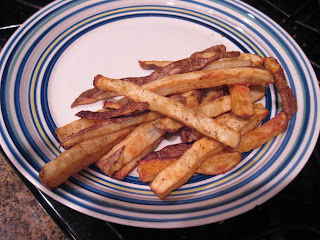 Peel (optional) and cut potatoes in fries. Tosss in a boll with oil, salt and pepper. Place on parchment paper and cook 45 minutes at 400. Broil fish for 8 minutes. 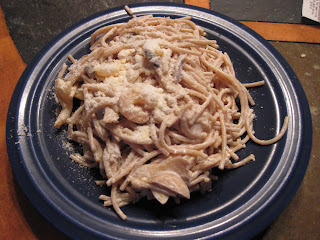 MEANWHILE mix the parmesan, butter and miracle whip in a bowl until a paste forms. 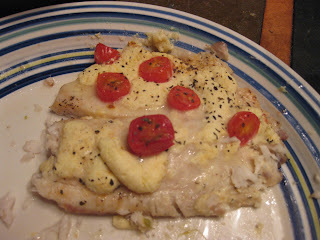 Remove fish from oven and spread the cheese mixture on top of each fillet. Blend all ingredients together in a bowl until smooth. To serve: Either dip fresh fruit in it or spread it on a cake for a yummy cream cheese frosting. *You can also mix crushed candy (Reese's or M&M's) or Cocoa Powder to make different varieties. Meanwhile, spray 8x8-inch baking dish with cooking spray. In 12-inch nonstick skillet, cook beef, onion and garlic over medium heat, stirring frequently, until beef is thoroughly cooked. 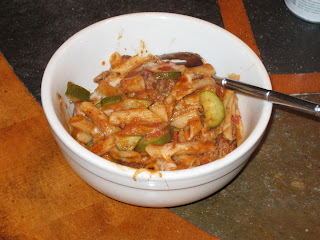 Stir zucchini into beef mixture; cook 2 minutes. Stir in tomato sauce, tomatoes, oregano, salt and pepper. Heat to boiling. Add drained pasta; toss to coat. Spread in baking dish. Cover dish tightly with foil; bake 20 minutes. Remove foil; sprinkle with cheese. Bake uncovered about 5 minutes longer or until cheese is melted. Coat a 10-inch skillet with nonstick vegetable spray. Heat over medium heat. When hot, add chicken and cook until light brown, about 3 minutes on each side.